Adjective, Slang. Characterized by or defining oneself by ecological awareness, liberal political views, and support or use of natural products and health foods. (I’d like to add that, in my experience, this term is occasionally shortened to simply “crunchy.”) One could safely conclude, based on the existence of this term, that people who fit the above description eat (a lot of) granola. But I ask you this: Is it cause or effect? You might think that hippies enjoy this snack because it’s healthy and travels well in their hemp satchels, but maybe eating granola, with all of the beneficial nutrients it supplies to the brain, actually promotes open-minded thought. And really, is it so unreasonable to think that a person with a belly full of the cereal will be more inclined to protect the environment? Isn’t that how we make sure there will be lots more oats, dates and nuts to go around? Seems plausible enough to me. 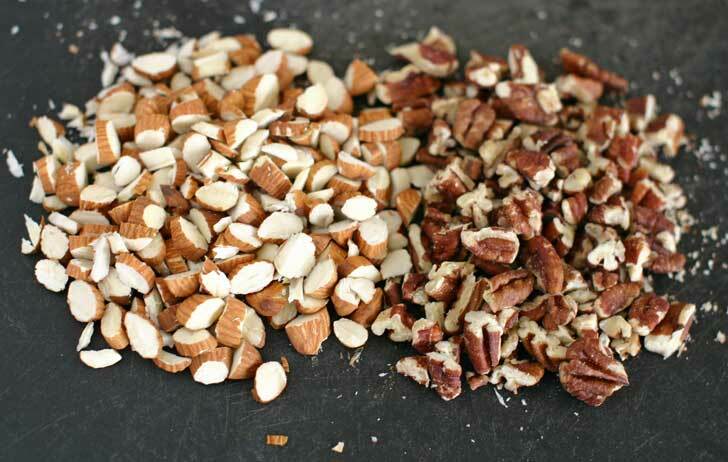 Carefully slice the raw almonds by hand with a sharp knife and roughly chop the raw pecans. Transfer to a bowl, cover with water and allow them to soak for a few hours. Soaking nuts before consuming them helps with digestibility. 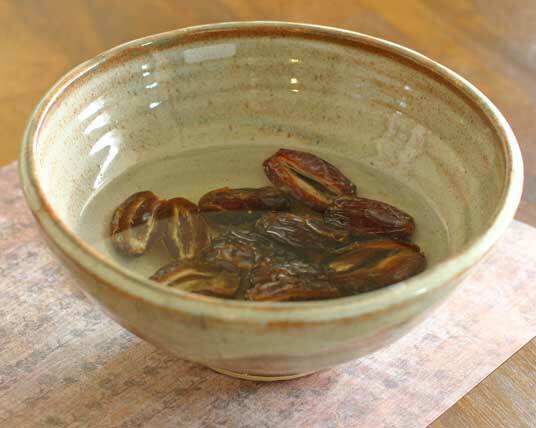 If your dates have not already been pitted, remove the pits now. Soak 9 of them in water to soften. Chop the remaining 5 dates into small pieces and set aside. 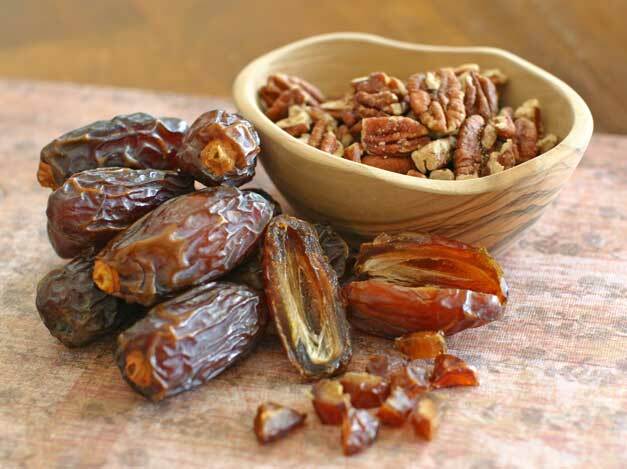 No need to soak these dates; they will be added to the granola at the end. Once the fruit and nuts have soaked for a few hours, we are ready to begin. Preheat the oven to 325°F. Line a jelly roll pan or cookie sheet with parchment paper (a pan with edges is ideal). 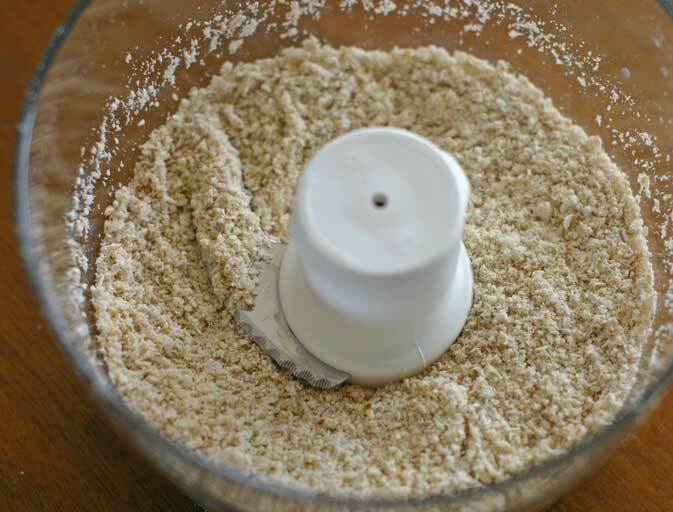 Grind a half cup of the rolled oats and all of the shredded coconut into flour in the food processor. You can also do this in a Magic Bullet blender. Empty the flour into a bowl and set aside. Transfer the soaked dates to the food processor and add the chopped apple. You can leave the skin on the apple, but use an organic one if you do. 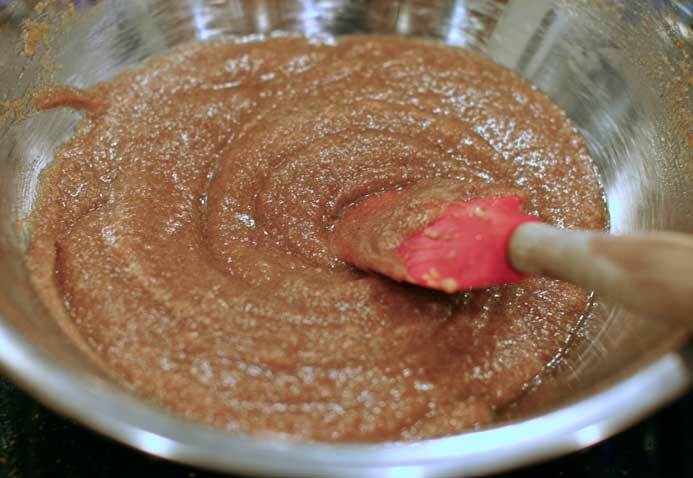 Blend the apple and dates into a smooth puree. You can add a splash or two of apple juice or water if necessary to get things moving in the processor. Next, transfer the fruit puree to a medium bowl. Add the coconut oil (melted to a liquid), vanilla, lemon juice, cinnamon, maple syrup, brown rice syrup and sea salt. Stir by hand to mix the wet ingredients together. Grind the flax seeds in the Magic Bullet or other blender or spice grinder. Add them to the mixture and stir to combine. 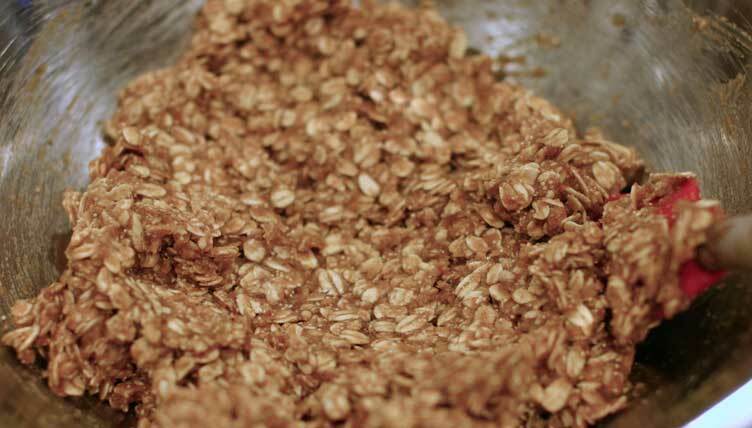 In a separate large bowl, toss together the remaining rolled oats and the amaranth. Pour the wet ingredients on top of the dry ones and stir vigorously to coat the oats evenly with the puree mixture. Add the oat + coconut flour. Drain and rinse the soaked pecans and almonds and add those to the mixture as well. Stir to combine. 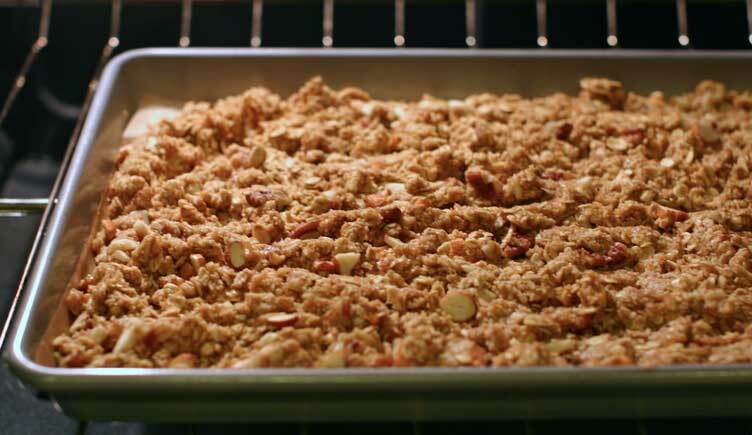 Spread the granola out evenly over your lined baking pan. Bake for 30 minutes, and then remove the pan from the oven and stir the granola. Return it and bake for another 15 minutes. Remove from the oven again and stir in the chopped dates. 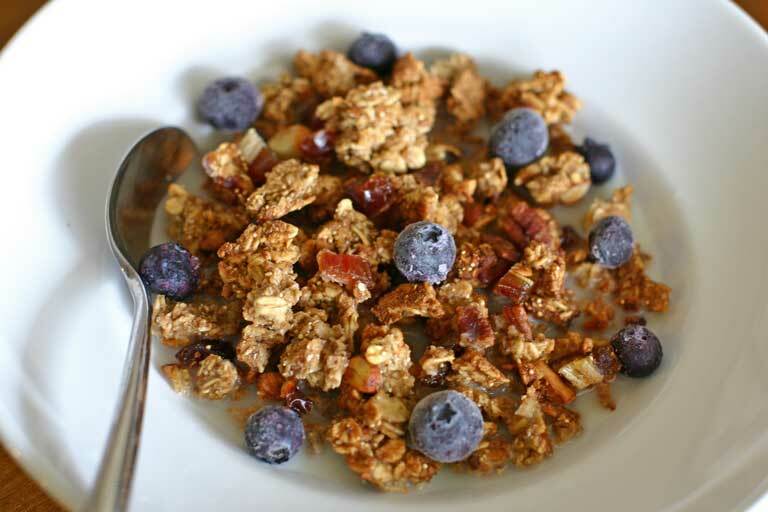 Toast the granola for 10 more minutes, and then allow it to cool on the stove top. 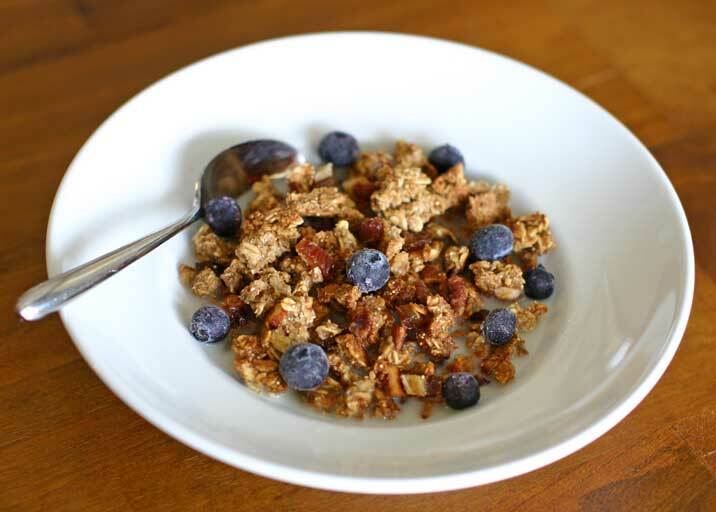 Break up any large crumbles and serve with some homemade almond milk and fresh fruit. Store the leftovers in a glass jar or Ziploc bag. 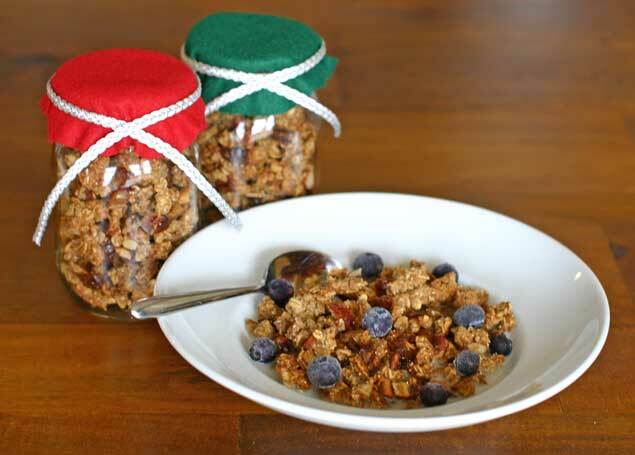 This granola also makes an excellent holiday gift! 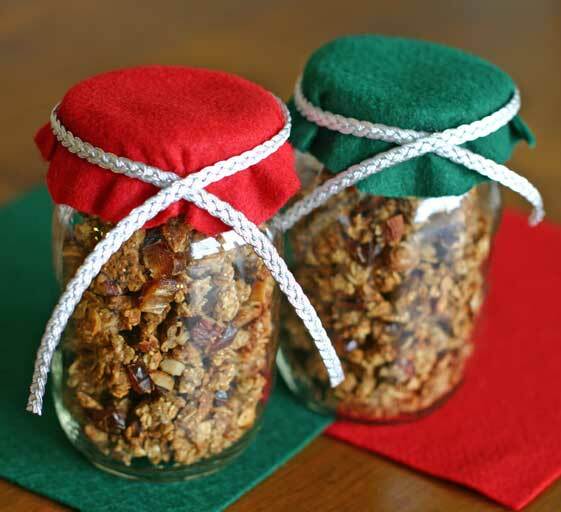 Presentation is key, and here is one easy way to dress up your granola for the holidays. You’ll need about four pint-sized canning jars. You can pick up a few pieces of felt at Michaels for 29 cents each and pretty ribbons are readily available there as well. Holiday printed fabric would also work nicely. Then you just need a sharpie, a rubber band, a pair of scissors and some craft glue. 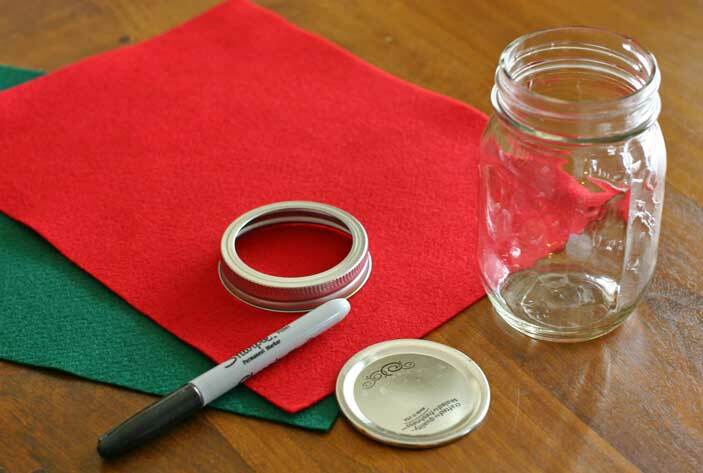 Place the lid of the jar on the back of the felt and use the Sharpie to place dots roughly a half-inch away from the lid, all the way around. You can just eyeball the distance – it doesn’t have to be perfect. Cut out the circle you’ve dotted in. Make a little slice on two opposite sides of the circle to about a half-inch in from the perimeter. Fill the jar with granola and affix the lid. 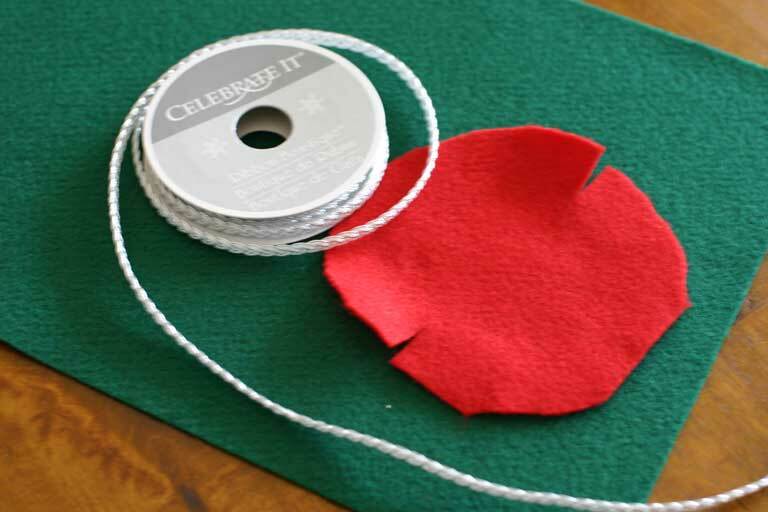 Place your circle of felt on top of the lid and secure it in place with the rubber band. Put a dab of glue on the rubber band and hold a ribbon to the glue a few inches from one end of the ribbon. Wind the ribbon around the lid so that it covers the rubber band, then place another dab of glue on top of the ribbon where you started and hold the ribbon there until it dries. Tie a bow or simply let the ribbon hang, as I have. Now you can get creative and glue an ornament or a peppermint candy to the place where the ribbon crosses over on itself, and if you have some extra time, make a pretty label to stick on the jar. This makes a very nice gift for friends or co-workers. Amaranth is a “pseudograin,” a seed that is used like a grain, but it is gluten-free, which is an added benefit for those with gluten sensitivity. It is a good source of protein (9 g per cup) and provides a good amount of calcium (12% DV) and iron (29% DV per cup). 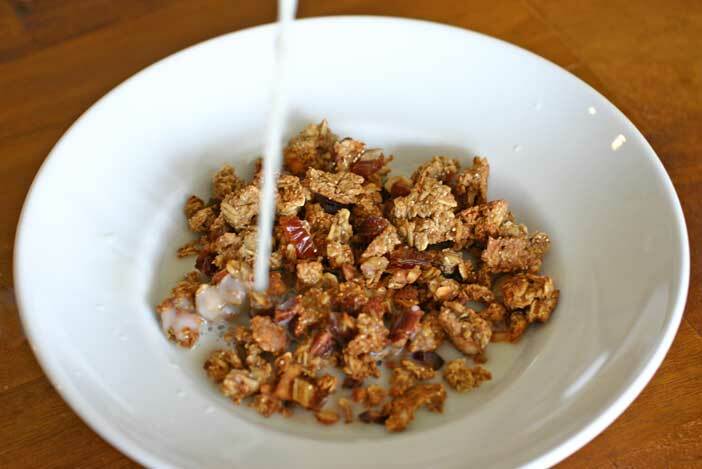 4 Responses to "Crunchy Almond Pecan Granola"
How long does this last before it spoils?